Mendocino Redwood Company to log NW of Ukiah, CA. 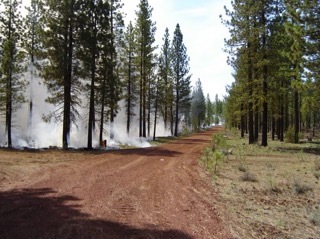 Sierra Pacific Industries to clearcut log NW of Eagle Lake and Susanville. This THP is about 14 miles NW of Eagle Lake and about 26 miles NW of Susanville, CA at an elevation of 5,280 to 6,400 feet. Sierra Pacific Industries is planning a clearcut tractor based logging operation in ponderosa pine, Jeffrey pine, white fir, license cedar and sugar pine forests. There are 5 seasonal wet meadows/lakes including Straylor Lake, Long Lake, Shroder Lake, Bear Lake, Bear Valley Reservoir and Schoonamaker Lake in the area. Five segments of roads are proposed for use inside class III (intermittent) watercourse areas, and the construction of temporary “jump” spur roads are proposed under 500 feet long without pre designation. 30 road drainage sites are planned for work including rocking, dip construction, ditch cleaning and culvert repair/replacement. There are goshawk nest sites at the corner of sections 1 and 12, and sections 6 and 7 within 1 mile of proposed harvest units. Greater sandhill cranes have been reported at Bear Valley Reservoir (.5 miles SW of the THP area, at Long Lake (1 mile NE of the THP area), and at Schroder Lake (.5 miles SW of the THP area). Prairie woundwort was found near Harvey Camp Pond, Disappearing monkey flower was found on the southern edge of unit 32, Foothill arnica was found along the eastern edge of unit 2, and the SW edge of unit 17, and Egg Lake monkey flower was found 400 feet south of unit 17. There is 1 CA spotted owl nesting territory within 1.3 miles of the THP area. Sierra Pacific Industries to clearcut log NW of Lassen Volcanic National Park. This THP is north of Highway 44 about 8 miles NW of Mt. Lassen, and about 12 miles NE of Shingletown, CA at an elevation of 4,100 to 5,600 feet. Sierra Pacific Industries is planning a mostly clearcut tractor based logging operation in ponderosa pine, sugar pine, incense cedar, Douglas fir and white fir forests. 33 road drainage sites are planned for work including rocking, dip construction, ditch cleaning and culvert repair/replacement. There is a northern goshawk nest in section 34, approximately 1.25 miles east of the nearest harvest unit, and a western pond turtle was reported (2017) at Bridge Creek in section 11, approximately 1,250 feet from the nearest harvest unit. A historic (1974) bald eagle was reported at Lake McCumber, 1.5 miles SW of the project area and osprey have been spotted foraging at Lake McCumber. Butte County fritillary was found in section 6 adjacent to seasonal road 365.2, and near the terminus of a proposed road. 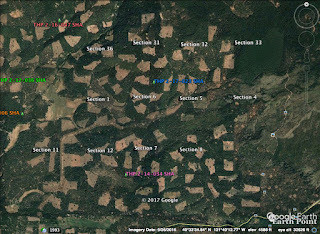 There are 2 CA spotted owl nesting territories within 1.3 miles of the THP area, including a CA spotted owl nest in section 30, 1.25 miles north of the nearest harvest unit, and also in section 36. 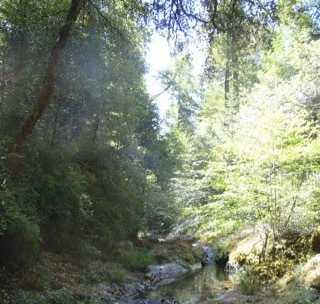 This THP is about 9 miles NW of Ukiah, CA and Highway 101 at an elevation of 1,300 to 2,480 feet. Mendocino Redwood Company is planning a tractor, feller buncher and shovel logging operation on steep and unstable slopes in redwood and Douglas fir forests. 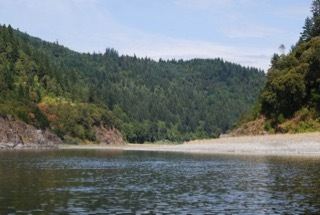 The THP area flows into the Russian River which is listed as an impaired watershed for sediment. There are 26 landslide terrain sites within the THP area including; debris slides, earth flows, disrupted ground, and road failure sites including fill failures, cut bank failures and sink holes. Mendocino Redwood Company is planning to use ground based equipment on unstable slopes (disrupted ground) within designated skid trails, and use a landing and a portion of a skid trail inside a class I (year round) watercourse area (Ackerman Creek). 14 road drainage sites are planned for work including rocking, dip construction, ditch cleaning, culvert repair/replacement and restoration of washed out crossings. Four sensitive plant species were reported including; one occurrence of north coast semaphore grass within the southern most harvest unit, 2 occurrences of white flowered rein orchid along a class III (intermittent) watercourse, and bristly leptosiphon and Mendocino tar plant. There are 2 spotted owl nesting territories within .7 miles of the THP area. This THP is about 5 miles SE of Klamath, CA and about 4 miles east of Redwood National Park and Highway 101 at an elevation of 60 to 1,400 feet near the Klamath River. 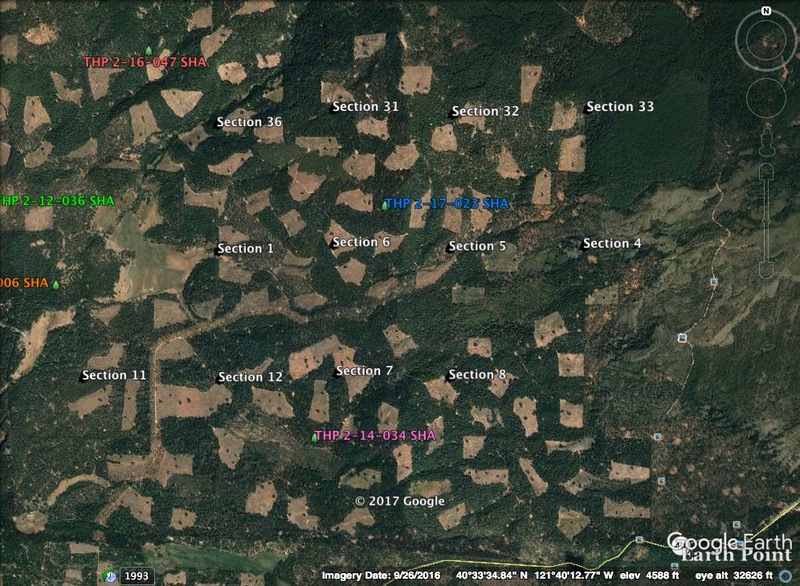 Green Diamond Resource Company is planning a mostly clearcut tractor and cable logging operation on steep and unstable slopes in redwood and Douglas fir forests. The THP area flows into the Klamath River which is listed as an impaired watershed for sediment, temperature, dissolved oxygen and nutrients. There is a shallow rapid landslide below unit B, and above unit A, and 5 shallow rapid landslides in or near unit E. Green Diamond Resource Company is planning to re-construct 2 segments of the SA-10 road across unstable areas, re-construct an existing road across an unstable area in unit D, and re-construct 540 feet of the SA-1700 road within 100 feet of a watercourse in unit D. Re-construction of steep roads are proposed within the THP area including; 2 segments of seasonal roads with slopes over 20% grade exceeding 200 feet in unit A, 1 segment of seasonal road with slopes over 20% grade exceeding 200 feet in unit B, and 1 segment of seasonal road with slopes over 20% grade exceeding 200 feet in unit F. There are 7 osprey nests within .25 miles of the THP area including; 4 osprey nests within .25 miles of existing haul roads, 1 osprey nest within .25 miles of unit D, and 2 osprey nests within .25 miles of unit E. One bald eagle nest is located .32 miles SE of unit F, and within .25 miles of the CL 1800 Road, and marbled murrelet habitat is located within .25 miles of the S-Line Road on Prairie Creek Redwoods State Park land. Southern torrent salamanders are known to occur in or around units B, D, E and F, and Del Norte salamanders were observed inside units B and F (1990), and within units D and E (1991). 36 road drainage sites are planned for work including rocking, dip construction, ditch cleaning, culvert repair/replacement and restoration of washed out crossings. Spotted owl nesting territories are located within .5 miles of units A, B, C, E and F.
Humboldt Redwood Company to log inside large tree marbled murrelet stands near Carlotta. This THP is about 5 miles NE of Carlotta, CA and Highway 36 at an elevation of 480 to 2,150 feet. Humboldt Redwood Company is planning a tractor and cable logging operation on steep and unstable slopes in redwood, Douglas fir and grand fir forests. The THP area flows into the Van Duzen River which is listed as an impaired watershed for sediment and temperature. There are 46 landslide terrain sites including earth flows, debris flows, gullies, disrupted ground, debris slides, rock slides, steep inner gorges, and multiple road failure sites including deposits on the road surface, bank sloughing, cracking, fill failures and cut bank failures. 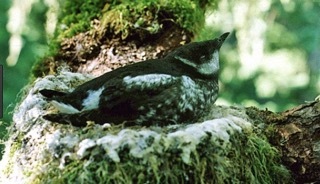 Logging is proposed inside large tree marbled murrelet stands 543D & 570D in unit 4, and marbled murrelet stands 212B and 220B in unit 2. Humboldt Redwood Company is planning to use ground based equipment in areas designated for cable logging operations, and use ground based equipment on skid trails, on existing roads and to construct roads in unstable areas at 24 locations. They also are planning to use ground based equipment on a landing within a watercourse area in unit 5, and on a landing and on 3 segments of skid trails within a watercourse area in unit 7. 91 road drainage sites are planned for work including rocking, dip construction, ditch cleaning, culvert repair/replacement and restoration of washed out crossings. There are over a dozen northern spotted owl nesting territories within 1.3 miles of the THP area.